Columbia paint wants to help you with your next interior painting project! Painting requires a lot of planning and preparation. If you want to achieve professional results with your next painting project, you need to give it the time and attention it deserves. Here are a few tips for producing professional painting results! Every professional painter always has an ample supply of painters tape on hand. In order to achieve optimum results, don’t use your painters tape sparingly. All too often novice painters neglect to tape around on and around intricate objects. 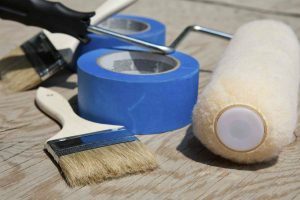 Be sure to tape up molding, baseboards, and trim. In many cases, certain obstructions often take too long to paint around. Save yourself some trouble and use tape to help you. In order to achieve high-quality results with your painting project, you need to be able to see well! A set of work lights can help you see the paint being applied to the walls. Generally speaking, lamps and ceiling fans are not sufficient when it comes to interior painting. For that reason, go out and invest in a set of inexpensive LED lights to assist you with your painting project. Professional painters use high-quality paints. If you want to achieve professional results, you can’t be cheap with your paint selection. Cheap paints often will require multiple coats. On top of that, you don’t want to find that your paint is chipping or peeling years later.